There was a sign for some cave beer on a building at the front. Near it was what we found out was a hostel. And farther back was a large wood building with some benches and tables, with leftovers of someone's lunch on them. So where were the caves? Still not exactly sure what we were getting ourselves into — besides the name of the cave, Optymistychna — the cave tour leaders geared us up, in nothing less than snowsuits from the 1980s, hardhats, headlamps, rubber boots, and gloves. They also warned us about our phones, to keep the screen facing toward our bodies, and for me to keep my camera under my snowsuit for the most part. What do you mean, be careful with our phones? What do you mean, hardhats are required? I thought we were just walking around for a bit in some caves. Oh, how I was wrong. Stefka, Vince, Savannah, Hannah, and Natalya hit the road to the cave. Once we were all suited up, us six girls, Vince and Stefka from Cobblestone Freeway Tours, our bus driver, and two cave experts (plus a cave expert dog) headed out on the road. Our tour guide dog chases a stork in the field we walked through to get to the forest. We kept calling out things we thought could be the entrance to the cave. A ditch in the field. Does that lead to the cave? A puddle in the forest. Does that lead to the cave? Well, finally we came to the cave entrance. One of the guides unlocked the door, we all got in single file, and we headed in. Right away I understood why we needed hardhats. You could barely stand straight in the caves, your head hitting the sides every two steps. Except for our guide, who wasn't even wearing a hardhat. We had to squeeze through the cave formations, the path so narrow at times my boot wouldn't even lie flat on the ground. And then came the crawling. Our knees fit in the grooves made by other spelunkers. It felt like we crawled for 10 minutes, but it was only a couple at maximum. We did this for an hour, squeezing, dodging, crawling, and yelling "STOP" when someone trailed behind. Along the way, we saw clay art that students made, fungi, bats, and crystal formations. At the end of our hour of exploring, there was a display of crystals from other areas farther away. This opening was a welcome break from our constant hunched over position, because you could fully stand up and even stretch out your arms. So Vince, what does sunlight taste like? We followed the same route to find the cave entrance/exit, but this time it took us only 45 minutes, rather than an hour like on our way in. As I walked into the sunlight again, I felt like accomplished something, rejuvenated even. Our guide said there's no bacteria in the cave, and that the air can be healing. She also said people go into the caves to meditate, some saying they can feel the presence of spirits. We made our way back to where we got our gear and sat down for some locally brewed beer, which they call cave beer. We tried light, amber, and dark beer, and all were great. We drank them served at room temperatures since they were live beers, meaning they still contain live yeast, and apparently they shouldn't be stored too cold. The brewmaster is working on a new beer, one based on the taste of sunlight. (Huh?) Our hosts said when people spend long periods of time in caves, when they come into the light, they can taste sunlight. I'll have to go back once this beer is developed because I'm curious as to what sunlight tastes like. Optymistychna cave has 265 km mapped out. It turns out the cave we were in is a pretty substantial one. Below are a few quick facts. Optymistychna cave has 265 km mapped out, making it the world's longest gypsum cave. Though we spent only two hours in Optymistychna, some people camp in there, making their way to the areas like the lake that's five hours away or a cave passage that's 10 days away. Because we entered the cave at the base of a hill, we were about 60 metres below ground while we were exploring. During the Second World War, Jewish people hid in the caves for safety, according to our tour guide. 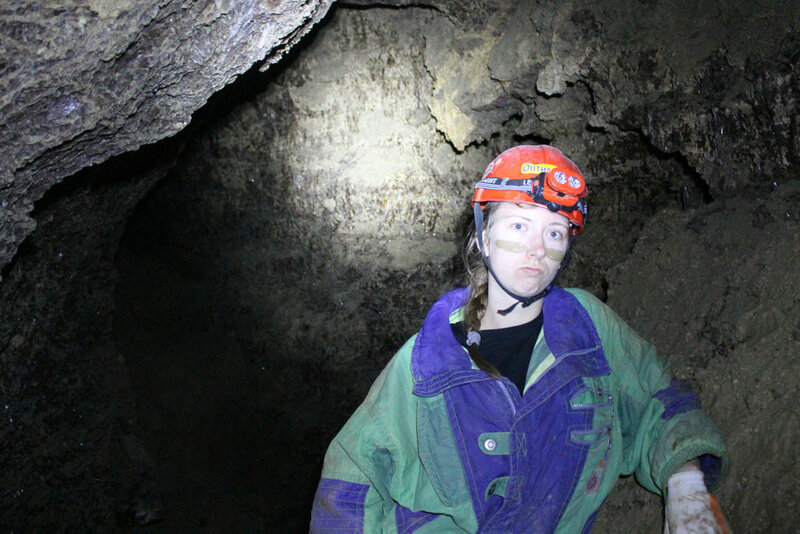 Spelunking isn't for everyone, but if you're willing to give it a shot, I encourage you to. I felt at ease in the cave, which I didn't expect at all. Maybe it truly does have healing energy.